Urology Associates of Central Missouri is proud to offer Axumin TM (fluciclovine F 18) injection PET scan for the detection of recurrent Prostate Cancer. AxuminTM imaging, showing area of biochemical recurrence in red. Blue inset is the FACBD-fluciclovine compound structure. U.S. FDA approved AxuminTM (fluciclovine F 18) injection is indicated for positron emission tomography (PET) imaging in men with suspected prostate cancer recurrence based on elevated blood Prostate Specific Antigen (PSA) levels following prior treatment (prostatectomy or external beam radiation therapy). 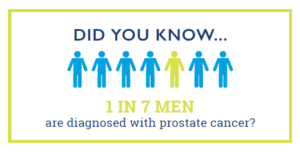 Prostate cancer is the second leading cause of cancer death in men. While most primary prostate cancer can be successfully treated, the disease recurs in up to one-third of patients. In some patients, recurrent disease is detectable only by a rise in prostate specific antigen (PSA) levels, yet the location of the recurrence cannot consistently be located by conventional imaging, severely limiting treatment guidance for these patients. AxuminTM was developed to target the increased amino acid transport that occurs in many cancers, including prostate cancer. It is labeled with the radioisotope F18, enabling it to be visualized in the body with PET imaging. AxuminTM can detect recurrent disease with PSA levels in the range of 1-10 ng/ml, which is the reason this scan is such an important advancement. Being able to detect metastatic disease early offers two important therapeutic advantages. First, the knowledge of where the cancer is located can help the Urologist determine the best treatment options, such as Intensity Modulated Radiation Therapy (IMRT) to that specific area while limiting damage to other areas of the body. The second offers a deeper insight into the disease process itself—revealing if the cancer has recurred or not, if so, to what degree, thus leading to earlier treatment of the disease. PSA levels can also be elevated due to the cancer metastasizing to the lymph nodes or bones. This is called a “systemic recurrence.” Systemic recurrences can spread throughout the body—a process that ultimately leads to death in more than half of prostate cancer patients. Thus, knowing the location of the recurrence answers an extremely important question: whether the recurrent disease is aggressive enough to metastasize. This knowledge frees the Urologist to implement a much more aggressive approach. Conventional diagnostic imaging with a CT scan and/or bone scan is typically of limited utility until PSA values rise to 10-20 ng/ml. Standard bone scans use a radioactive substance, called a radionuclide, or tracer, that will collect within the bone tissue at spots of abnormal physical and chemical change. AxuminTM exploits the fact that prostate cancers absorb amino acids at a much more rapid pace than normal cells do. The scan can detect biochemical recurrence to evaluate suspected nodal or metastatic disease where confirmation or exclusion of pelvic and/or distant disease would directly influence patient management. The most common adverse reactions were injection site pain and/or redness, and dysgeusia (abnormal taste in the mouth). Although not yet observed, hypersensitivity reactions, including anaphylaxis, may occur in patients who receive radiopharmaceuticals, so emergency resuscitation equipment and personnel should be immediately available. AxuminTM use contributes to a patient’s overall long-term cumulative radiation exposure, and safe handling practices should be used to minimize radiation exposure to the patient and health care providers. As with any imaging agent, image interpretation errors can occur. Interpretation of scans require additional training for the radiologists reading this type of scan. A negative image does not rule out recurrent prostate cancer (if lesions are small, they may be below the resolution of the PET camera) and a positive image does not confirm its presence, as fluciclovine uptake may occur with other cancers and is also seen in tissue affected by benign prostatic hypertrophy (BPH) in primary prostate cancer. Clinical correlation, which may include histopathological evaluation of the suspected recurrence site, is recommended. How do you prepare for your Axumin scan? Do not eat anything 4 hours before your check-in time. You may have small sips of water only to take medication if needed during that 4 hour time period. Eating and drinking within the 4 hours may cause your exam to be inaccurate. Avoid excessive exercise for 24 hours prior to your scan, this may cause your exam to be inaccurate. Remove metal and plastic items from your body. Inform staff if you are diabetic, taking steroid medication, over 400 pounds, claustrophobic, unable to lie on your back for an extended amount of time, or are receiving a high density contrast. 1.AxuminTM (Fluciclovine F 18 Injection) package insert. Blue Earth Diagnostics Ltd.   August 2016.